Non-toxic and environmentally friendly made from a natural vegetable based formula that is free of petroleum chemicals and dyes. 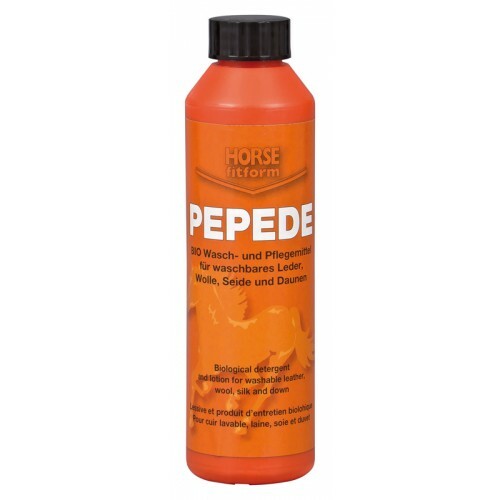 This mild wash is specially formulated without phosphates is very low sudsing and rinses clean. Can be used for cleaning waterproof breathable horse clothing, saddle pads, horse boots, breeches and shirts made of technical fabrics. This is highly concentrated with a recommended DILUTION RATIO OF 500 PARTS WATER TO 1 CAPFUL OF PEPEDE. •Environmentally friendly, phosphate-free and bio-degradable. •Will not compromise waterproofing or breathability. •Low sudsing and rinses easily. •Can be used in any water temperature.